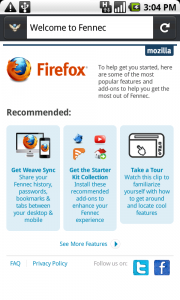 Although it is just a “pre-alpha” build you can see outright that Mozilla’s browser for Android phones nicknamed – Fennec or Firefox for Android has the makings of a pretty good if not great mobile phone browser. One of Fennec’s developer’s slipped out some details about Fennec for Android and while it’s full of precautionary statements, I went ahead and installed the browser on my Nexus One. The download and installation process went well without any hitch. Right after installing, I immediately fired up the browser – puff! My phone’s screen goes blank. So, I rebooted my phone and fired up Fennec again. Then there it was, rendering the startup page for Fennec on my Nexus One’s screen. I immediately type it some sites and noticed how fast the pages loaded up considering that it was still a “pre-alpha” release. Saving web pages into PDF – This is something that caught immediately caught my attention. This would come in handy for some offline reading of pages later on. Tab Browsing History – You’d see this pop out from the left-most side of your screen. A pretty neat way of saving your browsing history and accessing them again later on. Weave Sync – This looks like a pretty interesting feature. It will let you share bookmarks, browsing history, tabs and password between your Fennec on your mobile phone and Firefox on your desktop. Fennec for Android is still buggy at this stage and that’s pretty understandable since it is just a pre-alpha release. But that doesn’t mean that you can’t use and evaluate how good it is right now. One thing that I noticed that the browser lacks and which I hope the developers will work on before the public release are pinch-to-zoom and +- controls for zooming on web pages. Overall, Fennec for Android is a promising mobile browser that could give Opera Mini and the others a good competition. 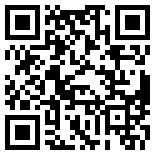 To download Firefox for Android pre-alpha release, scan the QR below.